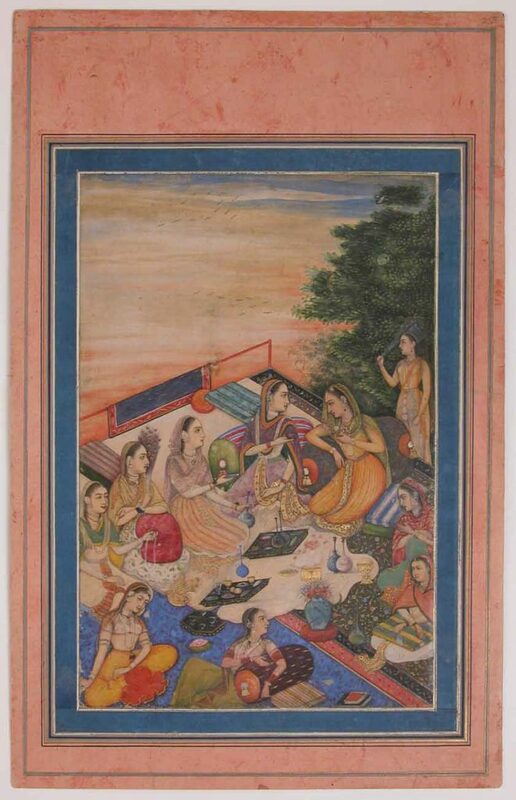 Professor Busch shares highlights from a book project (in collaboration with Dr. Molly Aitken) on “Aesthetic Worlds of the Indian Heroine” that explores Mughal India’s deep engagement with classical aesthetics through paintings and poems about female beauty. Many Mughal-period connoisseurs articulated their vision of the arts using the traditional Sanskrit vocabulary of rasa, or emotion. Evidence suggests how the gatherings where painting and poetry were experienced were a venue for self-cultivation and a means to strengthen bonds of love and friendship. The talk highlights the importance of aesthetics and affect in shaping the social and political worlds of Mughal India’s men and women. The event will be followed by the CISAR Annual Reception from 5:30 to 7, supported by the Varshney Family Fund. “Women Feasting on a Balcony”, Folio from the Davis Album (detail). Illustrated album leaf, late 17th-early 18th c., attributed to India. Theodore M. Davis Collection, Bequest of Theodore M. Davis, 1915, The Metropolitan Museum of Art, Accession no. 30.95.174.26.